Last week, while I was reading through a power outage, I polished off two lovely picture books notable for being pure entertainment with no improving ax to grind whatsoever. You know those cuter than ick photos people e-mail you of dogs and cats cuddled up together? Aaah, right? Well, Woof, A Love Story, by Sarah Weeks with illustrations by Holly Berry, does that without the ick. It's a very charming book in verse about star-crossed lovers who can't communicate but manage to find each other anyhow. Shark vs. 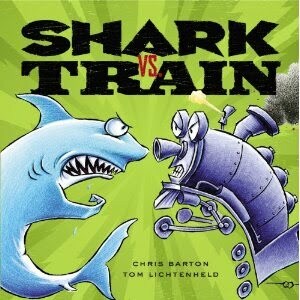 Train, by Chris Barton with illustrations by Tom Lichtenheld, might be described as a Deadliest Warrior episode for the toy box. These two toys don't just battle it out nose to nose but compete against each other in a series of events. 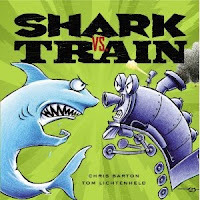 Be sure to check out the pre- and post-shark and train illustrations so you'll get the full story on what's going on here. By the way, Shark vs. Train recently got a mention in The New York Times Book Review.